The Parliamentary Standing Committee on the Posts, Telecommunication and Information Technology Ministry suggested the government to take necessary steps to build IT and Hi-Tech parks in all districts of the country. The parliamentary watchdog came up with the suggestion at its 22nd meeting held at Sangshad Bhaban with its chairman Imran Ahmad in the chair. The committee also recommended for selecting a site to set up an IT park in Sunamganj district and taking necessary measures to this end, a handout said. The meeting discussed the progress of the Bangabandhu Hi-Tech Park, Kaliakair and Sylhet Hi-Tech Parks and the Four-Tier Data Center in details. It informed that the construction works of the Four-Tier Data Center would be completed by March next while Prime Minister Sheikh Hasina is expected to naugurate the centre in April this year. Prime Minister Sheikh Hasina handing over cheque of financial help from her relief fund for treatment of film actor Ahammed Sharif couple at Prime Minister's Office on Thursday. President M Abdul Hamid on Thursday urged all concerned to highlight country's tourism sites and heritage across the world. "We have to nicely highlight our tourism sites along with our heritage,"
Newly appointed Indian High Commissioner Sreemati Riva Ganguli Das called on Dhaka North City Corporation Mayor Md Atiqul Islam at DNCC Bhaban on Thursday. 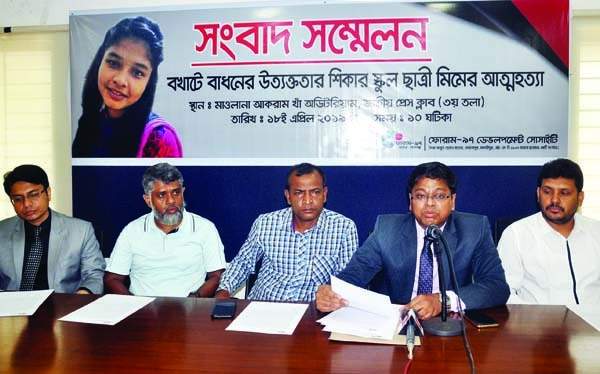 President Forum 97 Development Society speaking at a Press Conference at the Jatiya Press Club on Thursday protesting committing suicide of Mim as derailed boy Badhan eve-teasing her . Dhaka confident about winning IOM, DDG election BSS, Dhaka Bangladesh is highly confident about winning the election to the post of Deputy Director General of International Organisation for Migration (IOM) as several member states of the inter-governmental entity including India signaled their support. "Indian Foreign Secretary and many envoys of IOM-members states based in New Delhi said they would positively consider Bangladesh's candidature to the post of DDG of IOM," Bangladesh Foreign Minister M. Shahidul Haque told BSS in the Indian capital. Haque said he got a "positive wave" during his one-to-one talks with many envoys during a dinner last night in a Delhi hotel but added "since it is an election, so let me see what happens". Many IOM countries do not have their diplomatic missions in Dhaka and operate out of New Delhi to cover South Asia while Haque's interacted with them as the IOM election is due to be held on June 21. Bangladesh's top foreign ministry bureaucrat arrived in Delhi on a three-day official visit had a meeting with his Indian counterpart V K Gokhale on Tuesday and talked individually with at least 20 envoys of IMO-members states on Tuesday when he sought their support in a bid to be elected to the post as the Dhaka's nominee. Haque, who is closely familiar to the IOM functions because of his professional links, said Bangladesh's stood for safe and orderly migration. He said Prime Minister Sheikh Hasina wrote a letter to all of the 173 head of states of IOM countries earlier this month which was expected to have a positive impact on its election to the post. Haque said it was Bangladesh which floated the idea of safe and orderly migration across the world at a time when there has been growing resistance to migrants in certain parts of the world. He said Bangladesh was currently hosting over 11 lakh Rohingya refugees who fled Myanmar in the face of untold brutalities by Myanmar's security forces in Rakhine. Bangladesh's handling of the Rohingya crisis has received international acclamation; he said adding that this fits in with the IOM's commitment to the principle that humane and orderly migration benefits migrants and society. Bangladesh is contesting with four other countries like Jordan, Afghanistan, Philippines and Sudan.